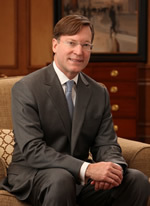 Wayne L. Hunter is Co-Founder and the Managing Partner of Harbert Growth Partners, as well as a Partner of Harbert Management Corporation (“HMC”). Mr. Hunter joined HMC in 2002 and currently serves on the boards of kaléo, MapAnything, Netsertive and Springbot. He previously served on the boards of Unitrends (sold to Insight Venture Partners) and Yap (sold to Amazon). Mr. Hunter also serves on the boards of the Florida Venture Forum and Venture Atlanta and previously served on the boards of North Carolina’s Council for Entrepreneurial Development and Virginia’s Center for Innovative Technology. Prior to joining HMC, he was founding Managing Director and Head of Wachovia’s (and predecessor firms First Union Securities’ and Wheat First Butcher Singer’s) Technology Investment Banking Group. In addition, he was a member of Wachovia’s Private Equity/Venture Capital Fund Investment Committee and served on Wachovia’s Investment Banking Management Committee. During his tenure in investment banking, he advised on more than one hundred financing and M&A transactions for clients in the communications, technology, and healthcare sectors. Mr. Hunter has more than thirty years of experience working with leading entrepreneurs and venture capitalists in the Southeast and Mid-Atlantic regions. Mr. Hunter holds a degree in law (J.D.) from the University of Alabama School of Law and a Bachelor of Science degree (Economics) from Auburn University.